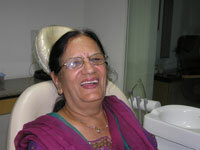 Dentures :: Precious Smile Dental Cosmetic Centre :: Surat :: Gujarat :: India. When one loses all teeth complete dentures can be constructed. Teeth gets support from underlying bone of the jaw. Dentures need to be checked regularly by the dentist because the mouth changes and the denture may not fit as well as it should and may require a reline. If only a few roots can be saved which are strong enough, an Overdenture, which is a denture which attaches to a couple of roots anchored in the jaw can be constructed. An Overdenture is a denture that uses precision dental attachments to hold the denture down. 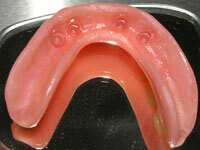 The overdenture attachment can be placed in tooth roots that have been saved. 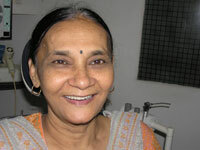 An immediate denture is constructed before teeth are removed so that one will not have to remain without any teeth. 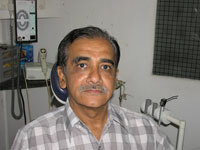 Constructing immediate dentures involves taking impressions (making copies) of your mouth before the teeth are removed. 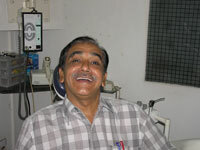 When your remaining teeth are removed the denture can be inserted immediately. 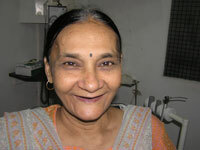 Post operative visits will be required to check the extraction sites and make required adjustments to the dentures. Because the mouth will change after it heals, your dentures will need to be evaluated at 3 month intervals and will need to be relined to fit the changes that have occurred in your mouth. Dental Implants are screws made up of titanium metal and resemble tooth roots. Holes are made into the jaw bones and implants are placed and covered over. The implants then heal and integrate with the jaw. 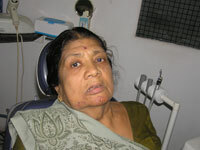 After healing an artificial top is placed into the implant containing an attachment for dentures. A dental implant provides a foundation to hold down a denture and hold it firmly in place. 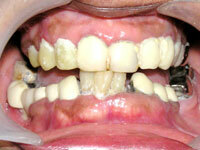 A full denture is difficult for many patients to wear and get used to. Sore spots and difficulty in chewing is caused when a denture moves around in the mouth. Over the period of time the dental ridges required to support a denture will shrink creating a problem keeping dentures in place. Lower dentures require 2 or 4 implants to properly hold them in place for normal function. 2 implant supported denture will be implant and tissue supported denture while with 4 implants it will be totally implant supported denture. Although implants are usually placed for stability of lower dentures, implants can also be placed to add to the stability of upper dentures. The success rate of properly cared implants is approximately 95%. Removable partial dentures usually consist of replacement teeth attached to pink or gum-colored acrylic base, which are connected by metal framework. Removable partial dentures attach to your natural teeth with metal clasps or devices called precision attachments. Precision attachments are generally more esthetic than metal clasps and they are nearly invisible. Crowns on your natural teeth may improve the fit of a removable partial denture and they are usually required with attachments. Dentures with precision attachments generally cost more than those with metal clasps. Consult with your dentist to find out which type is right for you. This type of partial denture has acrylic teeth , gum areas with metal framework which has precision attachment attached to the adjacent teeth . Now a days Flexible deture material is also available for comfortable placement, removal and fitting. 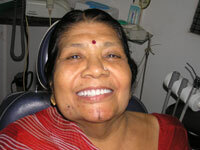 How long do I need to wait after extraction of teeth to get my dentures? It is advisable to wait for at least 4 weeks after the extraction of teeth before the dentist can initiate the process of denture construction. This gives sufficient time for the extraction wound to heal and for the underlying bone to remodel. Dentures are made to stay in place by their close fit with the underlying tissues. The dentures are mada in such a fashion so that they adapt closely to the underlying tissues, it creates a vacuum seal that retains the denture in place. The thickness and quantity of saliva plays an important role in the retention of the denture. Do you need to replace dentures after a few years? Ideally dentures have to be replaced every 5 years. With the passage of time there will be a change in the shape and form of the tissues that hold the dentures. So in due course of time the dentures loose their exact fit and can cause injury and irritation to the underlying tissues. Do new dentures cause sores? 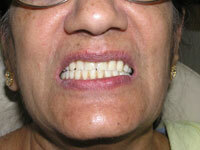 Yes, very often the new dentures may cause areas of soreness in the underlying tissues. Even the most nicely made dentures may cause some irritation when newly worn. These are usually due to a sharp spot on the denture that irritates the tissue or sometimes may be due to a sharp bony area in the tissues. These areas of irritation should be brought to the notice of the dentist to do the necessary modifications in the denture to relieve these areas. Do I have any restriction on the food I eat? Even the best of the dentures may not perform as well as your natural teeth. One has to learn to use the dentures. It is best to avoid hard food like raw carrots, nuts, etc. Soft food, in small pieces is ideal for denture wearers. The food should be chewed on both sides of the mouth simultaneously. Will I experience problems of speaking? Speaking well with the new dentures will also take some time.The dentist will advise new denture wearers to read aloud from a book or newspaper to help in adapting to the denture. Do I need to give rest to my dentures? Wearing and using dentures puts a lot of stress on the tissues beneath it and therefore it is essential that they be given adequate rest to recover. This is best done at night or at any time the denture user sleeps.